(2006) Gilbert Arenas Wins Shootout With Kobe Bryant, 60-45! Forget the $20,000 shootout with Deshawn Stevenson. Forget the almost locker room shootout with Javaris Crittention. When I think about shootouts and Agent Zero, I think about December 17th of 2006: the day Gilbert Arenas dropped 60 points, 8 rebounds and 8 assists on Kobe Bryant and the Lakers in a 147-141 OT win. 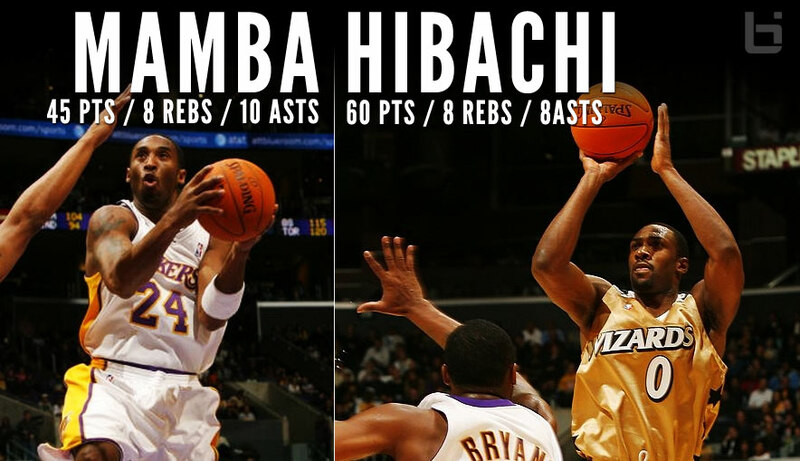 Kobe, who was coming off a 53 point game, wasn’t too bad either: 45 points, 8 rebounds and 10 assists. The 60 by Arenas was not only a career-high but a franchise-high, beating Earl Monroe’s 56. It was also the first time a player dropped 60 on the Lakers since Wilt Chamberlain did it 40 years earlier in 1966. Arenas’16 points in OT is also an NBA record and after the game, he didn’t sound too shocked at what he accomplished. “It was bound to happen,” Arenas said. “I’m a scorer, so I was going to have one of those days where I was clicking. Most of the time when I’ve scored 46 in three quarters, we were blowing the other team out, so I didn’t get to play in the fourth. Even the master of making awful shots look good was impressed with Arenas’ shots. And he kept making them during his hot December that saw him average over 30 points and score 54 against Steve Nash two games after this one and 51 on Deron Williams later in the month. The two scoring machines have had a lot of great battles against each other and in 2012 — when most teams weren’t willing to touch a free agent Arenas — they almost became teammates. Lakers GM Mitch Kupchack met with Arenas during a private workout and Kobe Bryant was all on board to bringing Hibachi in. It never did happen but over the past four years, Gilbert has shared his fondness for Kobe quite a few times on social media. The most known time is when he posted a lengthy instagram post explaining why LeBron will never be Michael Jordan or Kobe Bryant. As cool as it is to hear Gilbert show how much he respects Kobe’s game, it was a lot cooler watching him try to disrespect Kobe on the court. There is one other shootout Gilbert was involved in that I love and was actually lucky enough to witness in person: Agent Zero vs TMac at the Hurricane Katrina relief game.